Point of Contact Gallery is hosting an opening reception for ‘Moments of Place,’ an exhibition by New York City-based artist Gwenn Thomas, on Thursday, Oct. 16. The reception will take place from 6-8 p.m. and is free and open to the public. Refreshments will be served. Free parking is available the night of the reception in the Syracuse University lot on the corner of West and West Fayette streets. 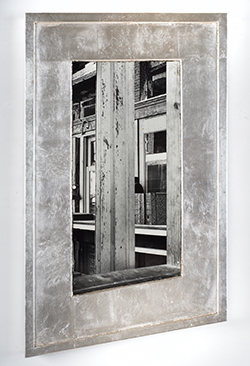 Thomas’ freestanding architectural fragments combine sculptural frames with shaped photos of doors and windows in a way that questions our perception of photographic imagery, particularly when and how it recalls experiences of lived space. Here windows are the oculus—the world viewed from inside the body from the seat of the brain located behind the eye. The content of the shots—window frames, exterior and interior architectural spaces—represent portals into another dimension. Thomas’ photos close framing and glossy window-like surface, have the presence of and are themselves both pictures and interpretations of an object. Thomas lives and works in New York. Her work examines how photography shapes our contemporary perception of painting. She is a graduate of the Cooper Union School of Art. She has shown recently at Exile Gallery, Berlin; Art Projects International; Rose Burlingham Gallery, NY; and Yvon Lambert. Her work is included in the collections of the Metropolitan Museum of Art; the Museum of Fine Arts, Houston; Philadelphia Museum of Art; the Fogg Museum, Cambridge, Mass. ; Sao Schlumberger, Paris; and C.A.M., Fundação Calouste Gulbenkian, Lisbon, Portugal. A survey of Thomas’ work has just been published by Charta (Milan, Italy) 2013.’Moments of Place’ will be on view from Oct. 16-Dec. 12. The gallery is open Tuesday-Saturday from noon-5 p.m. or by appointment. This exhibition is sponsored by the Syracuse University Humanities Center, organizer of the 2014 Syracuse Symposium™ on Perspective. Wednesday, Nov. 5, 6 p.m.
During this event, Thomas and panelists will present onthemes of perspective, perception and the viewer’s gaze in regard to her exhibition. Tuesday, Nov. 18, 6 p.m. These events are sponsored by the Syracuse University Humanities Center, organizer of the 2014 Syracuse Symposium™ on Perspective.